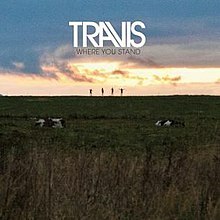 8 years on from the Man Who, the album that made them household names (and the album I just voted as the best British album of the last 30 years for the Brits), Travis did a conscious turn back of the clock. After the dark and moody 12 Memories, they teamed up with Nigel Godrich again, used their old logo, and made a proper Travis album. Except it kind of wasn’t. If anything, it’s a sequel to that pair of albums they made years earlier (The Man Who, The Invisible Band). That existential angst has matured, as the band now had kids and wives themselves. Whereas they have at times traded in anger, sadness and quiet frustration, here on The Boy With No Name, there is a bit more intelligence, a resigned sigh, and fitting in with the world. It’s a small difference, but a big one for a fan. As the Man Who and the Invisible Band were great albums for a confused, sensitive young man in his late teens/early 20s, so does this album sound great for that same guy in his late 20s. The two big singles really surround this point quite nicely. Closer is one of Fran Healy‘s very best moments. Neil Finn should be jealous. A beautiful, mature, it’s-just-you-and-me-and-I-love-you song of great intimacy yet wide appeal. It’s adult contemporary – not something you’d expect from a band once touted as the new Radiohead (I hate Radiohead, in case you don’t know). The other single, Selfish Jean, is a boppy pop rocker with a beat knicked from You Can’t Hurry Love. But it’s a farewell to a woman who doesn’t know what she wants, and it’s time to put those childish things away. The songwriting is really, really top notch. This album got many luke warm reviews, but some really out of the world reviews as well. Those who gave it time really heard the songwriting. It’s Healy doing what he does best. Battleships, My Eyes (a song for his son), the utterly unbelievable 3 Times And You Lose… all great. Just, not pop radio material. But that great intimacy that they are so great at, it’s all here. More than most bands, these guys sound like they are singing just for you. So this is another record I carried around with me a lot. And I know there were cooler records that came out in 2007, but truth is, I kept coming back to this one. The last track in particular, New Amsterdam, was a headphone favourite. 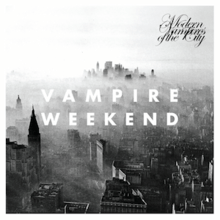 It’s some Healy only, a pretty folk melody and some non sequitur stuff about Paris, New York and travel. In my mind, seeing the world, it was all mumbled up just the same. Somehow, all those random images now have this random song as a soundtrack. I guess this album didn’t do very well for the band, and they have now taken their career back into their own hands. They got their records back. They started their own label. Healy‘s got a solo record due. I’ve liked every album to some degree, but this like Woody Allen coming back and doing one more screwball comedy with Diane Keaton. This could be the last time Travis sound so classic. And from their older place, it sounds like a goodbye. Back in 2001, I was writing a weekly column called ‘Strum’ for a Sydney magazine called Revolver. Because of this, I know I did an end of year bets of list, and the album that was number one was the Invisible Band by Travis. Something draws me to the Scottish. All that staying inside, I guess it produces very insular, thoughtful bands. For Travis, after the success of The Man Who, they made their best, most confident and thoughtful album. They abandoned the Oasis type posing of their first album, the Radiohead lite flourishes of the second, and made a Travis album. It’s an album of love. Of love gone right. Years of struggling had paid off, and singer/songwriter Fran Healy found himself in love. It is those love songs that make up the heart of the album. The massive hit, Sing, was a bit of joyous nonsense. But it’s Flowers In the Window that revels in the end of lonely nights, and pitter patter of tiny feet in the distance. The last track, The Humpty Dumpty Love Song, is one of the best things they have ever done. Haunting and longing…it offers a way out of the darkness presented on the Man Who. Sounding positive and happy without sounding corny is one of the hardest things in the world. But coming out of all that ‘millennial tension’, The Invisible Band was a perfect antidote. Listening to this album, you’d believe the band has never heard Radiohead and would never care too (although they share a producer). I listened to this album a lot. It made me feel better and it still does. It’s a Sunday morning album. The repeating chorus of Safe comes to mind. I feel safe around this record, like the world is going to be alright. And I’m going to be alright. I guess it’s not cool to sing about that kind of stuff. Musical delights are abound if you give it a try. The chiming guitar intro the Follow the Light – I’m surprised more people haven’t ripped that off. Dear Diary, as one review at the time called it, the best White Album song of the year. But for my money, my favourite song is the Cage. A song about a boy seeing how he’s not the right guy for a girl, and breaking up with her. I had been giving a life to a girl who I felt never really liked it. When that all ended, I had this song…not to wallow in, but to help me make sense of what happened. That’s the wonderful thing about a good song. I still buy Travis albums. 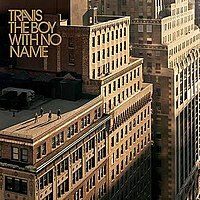 The Boy With No Name is just as good as anything they’ve ever done. I know their star has passed, but it’s something about the Scottish. They’ve got me hooked. Welcome to our annual top 10 countdown. Warning you now, a lot of music posts coming up. This could be considered loyalty buying if not for the fact I almost didn’t buy this album. But slowly, the singles started to get caught in my head, and I pulled out the money to see what my old friends were up to. There is a lot of talk about a return to form, that the wonderful politically angry Travis has been buried with 12 Memories. And that’s true, it’s not an angry record at all. And yes, it’s full of the optimistic melancholy that Travis mines better than anyone else. And in the end of the day, what I like about Travis is they are just good. No tacky tricks. No stadium anthems. It’s a very intimate band – which I guess is why fans get so obsessed. It seems songwriter Fran Healy is in a happier place. There is maybe a bit more optimism than melancholy this time around (and a theme in most of the albums I loved this year – happy albums). It’s slow, beautiful, and at moments very fun. The slow burn winner is the first single – Closer. The only way to describe this track is seductive. It’s a beautiful love song, nothing more, nothing less. Tremendous backing vocals. A classic that these guys will be playing at every concert for the rest of their lives. There is, of course, quite a few gorgeous mid tempo-y things on here. One Night and 3 Times And You Lose being top of the list. And some genuine rockers. Selfish Jean was everywhere on radio at one point. Eyes Wide Open is in the same mould. But two other songs are worth a mention. My Eyes, the current single, is pop bliss. When they abandon the sadness, they always do well. And a great film clip to boot. Finally, New Amsterdam, the closing track. So breezy, romantic and reminds me of listening to French records and having no idea what the singer’s on about. Just a loose collection of images, sparsely recorded, and sweet as truffles. Maybe it’s me, but I don’t need fireworks. I need just good solid bands. Songs I can rely on. And it’s been used as a degrading term for them, but I love a reliable band.